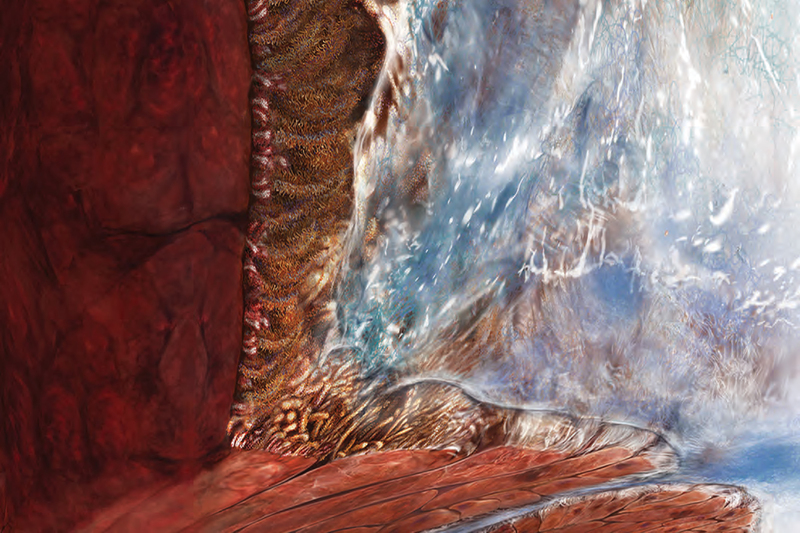 “Lung surface; protected by a mucus blanket” by Mehmet Kesimer, PhD, and Sarah Keilson, medical illustrator. 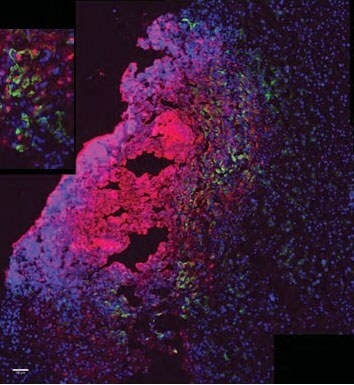 This image shows the layers of defense the pulmonary system uses to keep it effectively free of intruders. Ever wanted to see what a neuron looks like? Can you visualize the vessels that drain excess fluid from a heart? 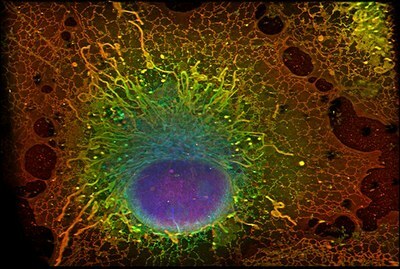 Images by UNC Lineberger Comprehensive Cancer Center researchers were among those chosen for an exhibition of work by UNC School of Medicine scientists at the North Carolina Museum of Art. “The Art of Science and Innovation,” exhibition was designed to reveal the “hidden beauty” of biomedical research. It will be on display through Monday, Jan. 14, in the museum’s East building. “We use art to understand science,” said UNC Lineberger’s Kathleen Caron, PhD, professor and chair of the UNC School of Medicine Department of Cell Biology & Physiology. “(The images in this exhibit) represent the laboratories where images and seeing are at the heart … of how (these scientists) answer questions,” she added. 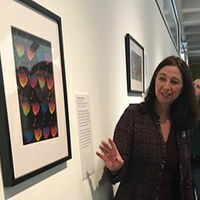 Caron explained the historical connection between art and science, as well as current basic and translational research efforts that are ongoing at the UNC School of Medicine during a tour of the exhibition. The exhibition includes images of neurons in a model of the brain, genetic material spilling out of the E. coli bacterium, and of the genetic material of a cancer-linked virus binding the DNA of its host. “I would totally put this in my living room,” Caron said, pointing to one vibrantly colored image that depicted cilia, hair-like structures that help sweep mucus out of the airway. 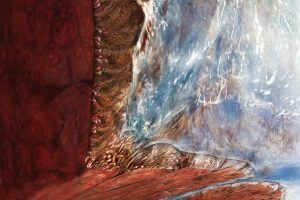 The piece, “Lung surface; protected by a mucus blanket,” was created by Mehmet Kesimer, PhD, and Sarah Keilson, medical illustrator. When this system does not function properly, people can develop diseases like cystic fibrosis. “You know when you get really sick? 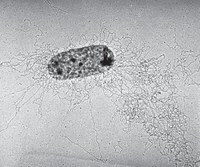 Here’s the culprit,” Caron said, pointing to an image of genetic material spilling out of E. coli. UNC Lineberger’s Jack Griffith, PhD, professor in the UNC School of Medicine Department of Microbiology and Immunology, used electron microscopy to capture the image. The tool allows for visualization of molecular properties, down to the coiled DNA from a single bacterium. “This is the difference between light and electron microscopy – we see at a very minute level,” she said. “One of the missions of the North Carolina Museum of Art is to connect art, nature and people, and this is a fantastic example of connecting nature and art with the researchers who have made it possible,” said Kat Harding, public relations manager for the museum. 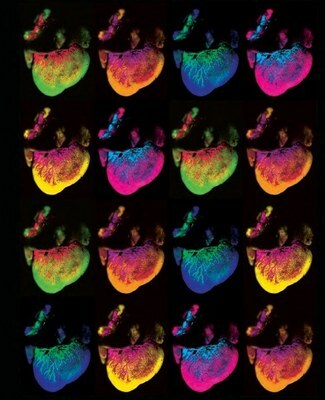 “A drain on the heart,” by Caron, Max Englund, and Klara R. Klein, MD, PhD, depicts a network of lymphatic vessels covering the surface of a mouse heart. “Viral control center: KSHV commandeers cell nucleus” by Dirk Dittmer, PhD, co-director of the UNC Lineberger virology and global oncology programs and professor in the UNC School of Medicine Department of Microbiology and Immunology, and Anthony Brent Eason, research technician. “An eye on the future” by Jean Cook, PhD, associate dean for graduate education at the UNC School of Medicine and a professor in the Department of Biochemistry & Biophysics. “Visualizing DNA replication in a developing animal” by Bob Duronio, PhD, interim chair of the Department of Microbiology and Immunology, associate dean for research, and professor of biology and genetics. 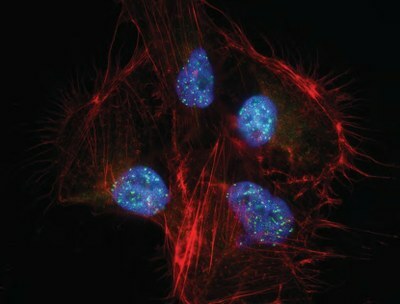 “Revealing cellular compartments” by Wesley R. Legant, PhD, assistant professor of in the UNC-NCSU Joint Department of Biomedical Engineering and the Department of Pharmacology at the UNC School of Medicine, through a collaboration with the Betzig and Lavis labs. “Preventing the Purple Death” by Edward Miao, PhD, associate professor in the Department of Microbiology and Immunology and Vivien Maltez, PhD.